I finally received the luggage rack that had been on back order for a few weeks. There had been some problems with the initial batch and after some concerns by customers the company decided to modify the rack. 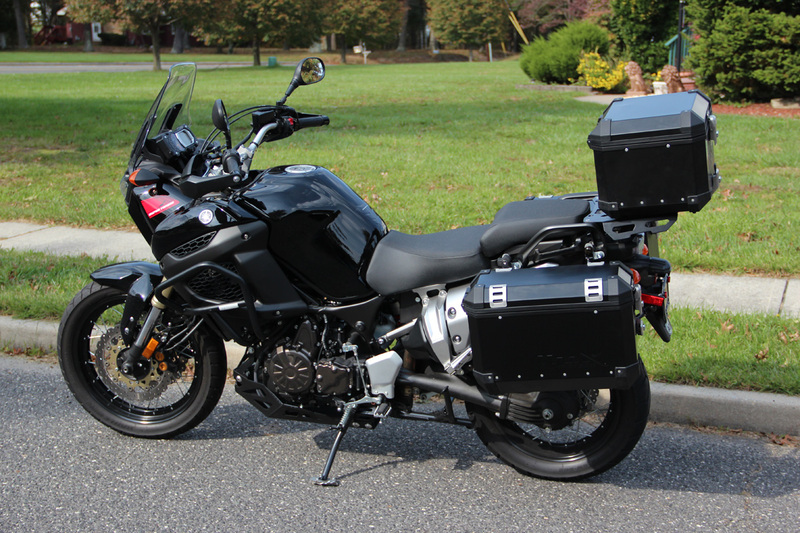 I had seen the SW-Motech TraX bags for the first time mounted on a Super Ténéré in Australia on the ADV Rider forums and immediately fell in love with the look. I first saw them in standard aluminum color but after I saw them in black powder coated aluminum I knew I wanted them for my bike. 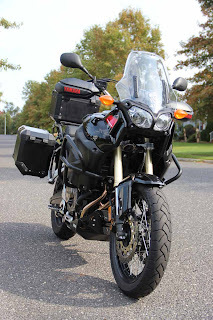 From the beginning I had pictured my Super Ténéré in full black guise and the TraX panniers would suit the Super Ténéré with the rugged look and continue with the dark theme. The Super Ténéré has the exhaust muffler on the left side and it's of considerable size due to the Environmental Protection Agency (EPA) requirements, which sets noise emissions standards for motorcycle exhaust systems. 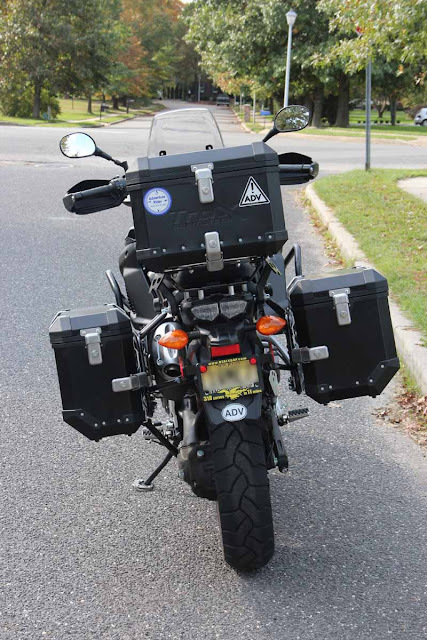 The luggage system has to take the muffler into account and that requires the panniers to be of different size to maintain symmetry. The left pannier is 37 Liters and the right side is 45 Liters. I added the top bag which is 38 Liters and allows for the storage of my helmet. I will be adding helmet locks to the sides of the top Altrider rack so that on long trips when the panniers are loaded I will still be able to safely secure my helmet to the bike. It's one of those convenience things that come handy when you have to park the bike in dubious places. All the locks on the panniers and the racks are keyed the same. The panniers can be easily removed by unlocking one lock that locks the pannier to the rack. The racks can also be easily removed by turning quarter turn screws and unlocking the Anti Theft Protection lock. On shorter rides I might just want the top pannier for convenience and the bike looks much better without the side racks installed. On other bikes the racks stay with the bike regardless if you carrying the panniers or not. The three panniers came with soft bags that fit inside to facilitate carrying stuff off the bike. 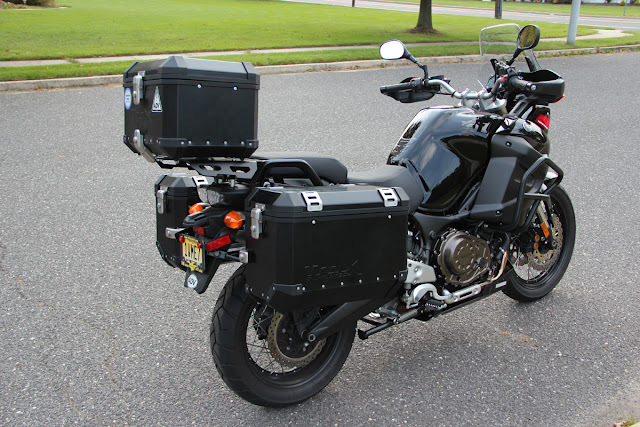 SW-Motech offers add-on soft bags that compliment the panniers and can be strapped to the top of the side panniers to increase storage space. Overall the TraX system offers a lot for the price. Lots of storage, sturdiness as proven by many that have traveled around the world and the looks to compliment the Super Ténéré. Spring can't come fast enough, it's going to be a painful winter. Very, very nice! Isn't it so wierd with the bags being such different sizes? The GS is that way too. But I just love the black powder coating! Whoa! Something looks ready for adventure. +1 for the black coating. THey look terrific. No shortage of room to cary stuff. Have you manged to get out a bit mate? Thanks. Have only been doing short rides around New Jersey, nothing special. I can't wait to go on a long trip. Well, George, looks like it's time for a sidecar. That should get you through the winter, plus you can spin some sweet donuts. I'm in as much of a rush to see the spring as you are, believe me. you bike is lookin' good. While black was not my favourite colour, I have ended up with a black car, a black jeep and a black bike for when I purchased the Vstrom I got a deal on the last "black" one. So I continued the theme just like you with everything black. Black crash bars, black top case, and black side cases, with black racks. Because of this I have a black riding pants, black boots and black leather riding jacket with black gloves. In a long about way I am letting you know that your black theme is looking great.
" 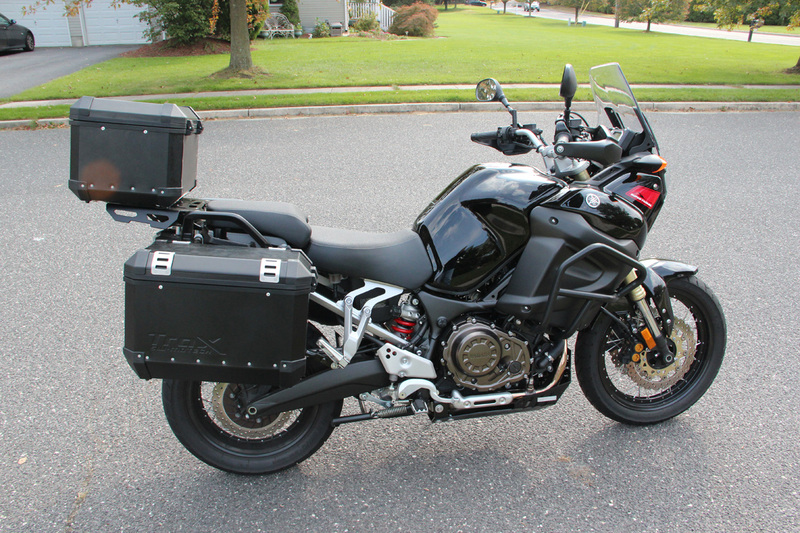 I will have lots of gear when I head towards Alaska ;-)"
Love the look in the black powder coat. 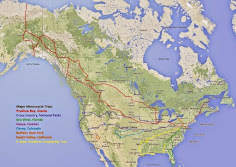 I know but I intend on riding it all the way from Jersey, will need to take clothes for at least a few days ;-) I plan on shipping knobby tires to Alaska and have them changed there for the trip from Fairbanks to Deadhorse. Thanks for stopping by. I'm thinking of putting a red stripe on the rim like the blue you have on your bike, did you do it yourself? 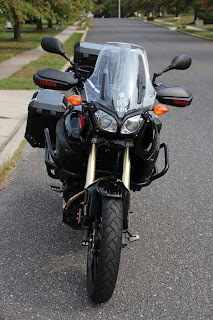 The panniers look very sharp....now the bike is begging for a long trip! Def, like the black. Adds a touch of class to the rugged adv bike look! Really sounds like a nice set up. I can already see all the mud on the black bike.